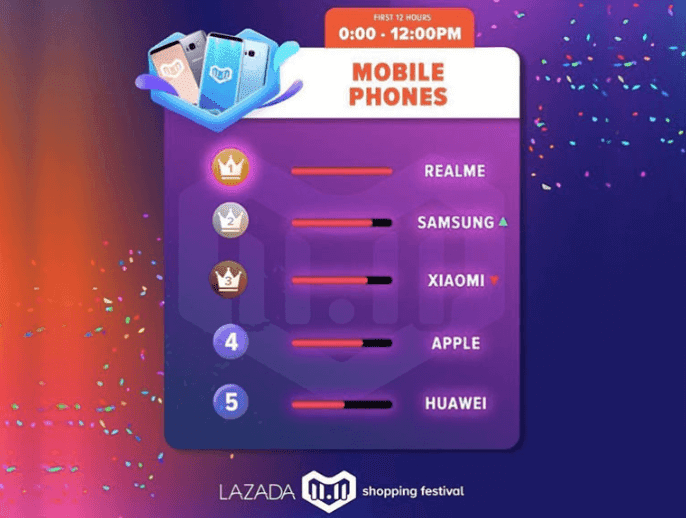 Realme generated the most sales during Lazada’s 11.11 Shopping Festival in South East Asia. Realme is about to make waves locally as it enters the Philippines soon. They already have official social media pages setup in preparation for their big outing. Recently, the company is making a name for itself by posting record sales figures at the Lazada 11.11 Shopping Festival of our South East Asian neighbors. Realme recorded strong online sales in Indonesia, the Realme C1 outsold its competitors by a large margin. In Thailand, they became the Double Champion by selling 1,000 units within the first 8 minutes of the sale. And in Malaysia, the Realme 2 Pro sold over 2,500 units for three hours on the day of the Shopping Festival, eventually selling out before it ended. “As a new smartphone brand in South East Asia, our achievements in the recently concluded 11.11 National Online Shopping Day in Lazada is a testimony that Realme is a game changer brand. With our upcoming launch in the Philippines, we are confident in delivering a new value to Filipino consumers soon,” said Josef Wang, Marketing Director of Realme SEA. The Realme 2 is a very affordable smartphone that boast with a 6.2-inch HD+ IPS display with a 19:9 aspect ratio, powered by octa-core Qualcomm Snapdragon 450 processor paired with 3/4GB RAM, 32/64GB storage, the handset is packed with 13MP + 2MP rear camera, and an 8MP selfie shooter. Priced at INR8,990 (which is around PHP6,000), it also comes with a large 4,230 mAh battery, a rear fingerprint scanner, and face unlock. The Realme 2 Pro, on the other hand, has a 6.3-inch full HD display with a dewdrop notch, an octa-core Snapdragon 660, up to 8GB RAM, up to 128GB storage, a 16MP + 2MP rear camera, and a 16MP selfie shooter. It also comes with a 3,500 mAh battery, face unlock, and a rear fingerprint scanner. The Realme 2 Pro is slightly pricier at INR13,990 (roughly PHP10,200). Realme isn’t available in the country at the moment, but the company already teased its arrival in the local shores. Many fans are also expecting that its new Realme 2, 2 Pro, and C1 will land in the country to mark the brand’s local launch.